About the program: The Walk In Art Center and Schuylkill Haven Recreation have partnered to get the public out and about using art! 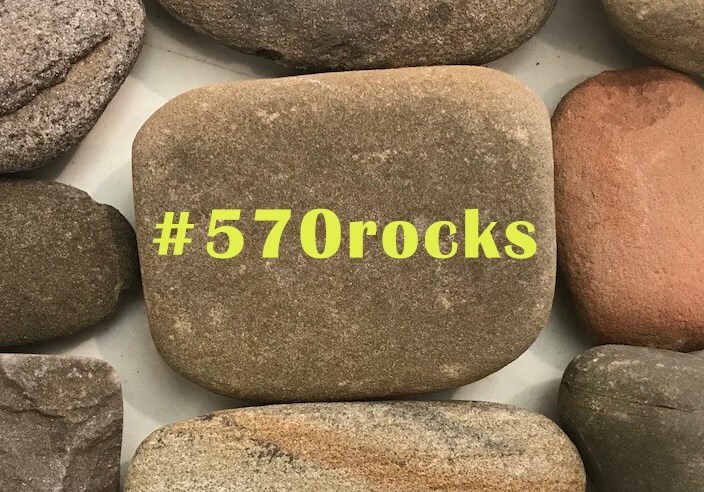 Active members of the #570rocks talk about the joy of spending creative time with family and friends, giving back and spending time in nature – off the couch and breathing fresh air. And who doesn’t love a good treasure hunt – families are walking, scouring local parks, searching trails and even climbing playground equipment to find a certain rock that was posted with a clue. Members of the #570rocks will feel that sense of community and mindfulness. Being out in nature and the community and being aware of your surroundings, you might find something other than a painted rock. Maybe a new store, a friend, a new place to watch the birds, etc. The Rules: Nothing explicit or political. Do not take rocks from public parks that do not allow it. If you are unsure, it is best to contact the parks department. If in doubt, leave it. Rocks can be purchased at Walmart, Home Depot, TB Landscaping, Lowes and other local stores. This is a gifting project – rocks are not for sale. you will be removed from the group. Posting on Social Media: #570rocks has a Facebook Page, Twitter and Instagram Page – we are working on Snap Chat. If you are having a rock painting class – you can create the event on #570rocks. You can post different things, but EVERYTHING must be pertaining to #570rocks. See the summary for more information on painting and official rules!